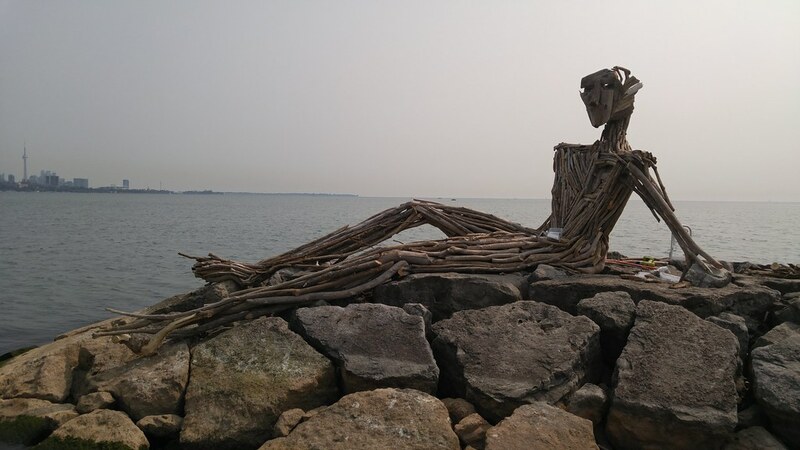 Toronto artists Julie Ryan and Thelia Sanders-Shelton are set to unveil their latest Waterfront driftwood installation. It's a giant that will soon have a heart. The heart is scheduled to be installed during the grand opening on Tuesday morning. I spoke with one of the artists today and was told this giant has a name. He's El Corazón, which is "The Heart" in Spanish. Here's a pic I took earlier today. I'll return to snap a picture of El Corazón with his heart in place. If you'd like to see pictures I've taken of their Toronto sign, here's a daytime shot and here's a shot I took at sunrise to commemorate my daughter's 13th birthday. that the Stay Puft Marshmallow Man was a real thing!! I asked the artist if I could call him Corey for short, and she was not amused! Very cool, saw this in the paper the other day. Prefer this to the destructive taggers painting the town. I'll bet that awful wind storm on the weekend took it out. I'll bike by tomorrow and snap a pic.